Are you a Sci-fi fan? Then you will certainly enjoy this huge universe theme logo badges creator! Why is this set so awesome? Because you can now create your own set of logos, stickers, badges, patches, emblems or any other type of design you think of, in your favorite space themes! Every set includes 24 different shaped and colored frames and 4 beautiful detailed illustrations to combine them with. All together that means you will get 96 frames and 16 illustrations that can be combined together. Just add illustration of your choice to a frame you like, write your own text and you have designed your own badge in just a few seconds. Collections are available as vectors but also as raster PNG images saved separately with transparent background and as layered PSD files. PSD file comes with a Bonus retro vintage effect layer and editable text (NOTE: you first have to download the font and install it before opening the PSD file, the link to download font is included in the PDF). Space logo badges would be an ideal promotion of any sci fi type of event (Comic cons, astronomical events, space conferences, sci fi fantasy conferences, space expositions, congresses etc). They are a great source of inspiration for your commercial and personal projects! Have fun experimenting and creating awesome custom designs, use vintage effect or keep them minimal and clean, sky is the limit! You can now create your own set of logos, stickers, badges, patches, emblems or any other type of design you think of, in your favorite space themes! 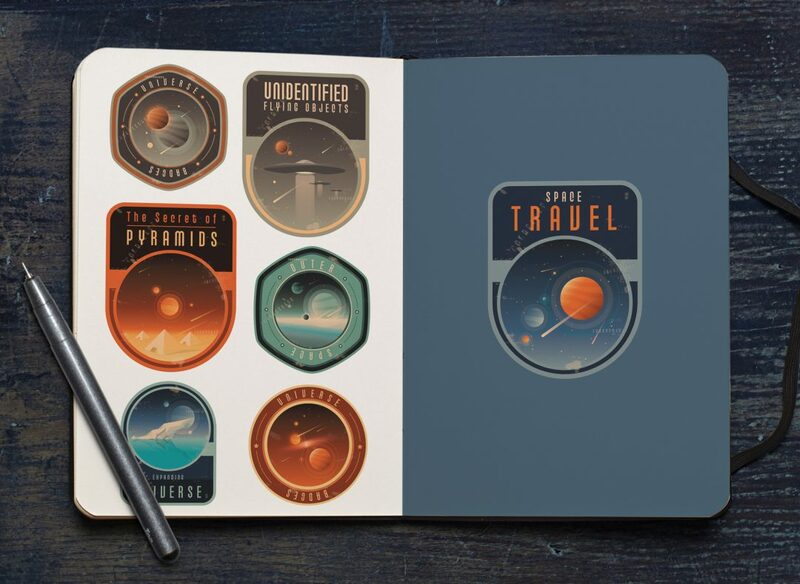 Hurry up and get your Space Logo Badges Creator!